← The JUNE fantasy baseball earnings report is here! Pitchers: Does A Surprising Start Persist? I recently wondered what to do about my Tout Wars pitching staff. 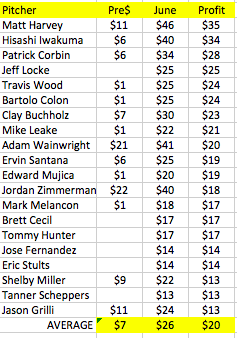 During the auction I had followed my plan (one derived from empirical evidence) to spend about $55 on pitching, planning to churn and search for pitching values off my reserve list and waivers. The plan worked to perfection, my team was in fourth place struggling in hitting, not pitching, but I was suddenly faced with a staff of massive overachievers in the first half. Shouldn’t I expect them to regress to the mean? And, what mean? Since most of these guys either had no or bad track records in the major leagues. Let’s take a look at this year’s list. Eight of them were not even bought on draft day, and of the 12 that were paid for seven cost $7 or less. No wonder robust thru-June earnings leads to robust midseason profits. 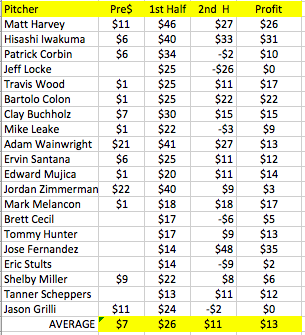 Let’s look at what happened to the Top 20 profitable pitchers in the first half of 2013. Similar results. Six were not bought aat all and nine cost $7 or less. A slightly lesser average cost, a slightly larger earnings and agreeable profits, for sure. But what happened in the second half of 2013. How did our big profiters fare? 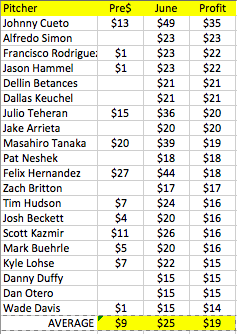 Thirteen of these pitchers turned a decent profit on the year, and 14 actually showed a nice profit in the second half. They didn’t do that much better in the second half than their draft day expectations, though they did do considerably worse than their first half. They can hurt you in a hurry. This entry was posted in Data, Prices. Bookmark the permalink. One Response to Pitchers: Does A Surprising Start Persist?